Food Matters is a hard-hitting, fast-paced look at our current state of health. Despite the billions of dollars of funding and research into new so-called "cures," we continue to suffer from a raft of chronic ills and everyday maladies. This film sets about uncovering the trillion-dollar worldwide "sickness industry," and exposes a growing body of scientific evidence proving that nutritional therapy can be more effective, more economical, less harmful, and less invasive than most conventional medical treatments. 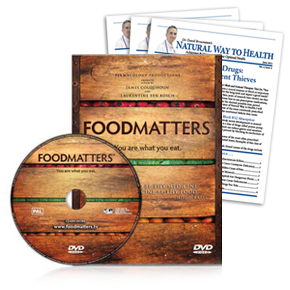 Food Matters features interviews with leading medical experts from around the world, who discuss natural approaches to preventing and reversing cancer, obesity, heart disease, depression, mental illness, and many other chronic conditions. Find out what works, what doesn't, and what's killing you. Becoming informed about the choices you have for you and your family's health could save your life. In a collection of interviews with leading Nutritionists, Naturopaths, Scientists, M.D.s, and Medical Journalists, you will discover . . . The best ways to detoxify, lose weight and keep it off! The best medicine certainly doesn't come in bottles . . . In fact, the best medicine is information. As you already know, with Dr. David Brownstein's Natural Way to Health, you'll grab priceless insights that can make a crucial difference in your own life, and gain a crystal-clear overview of the most promising natural health strategies. Comprehensive Reports. Each issue will include in-depth (but easy to read) reports focused on vital and timely health topics. You'll gain necessary knowledge about the most promising holistic and medical strategies to help many conditions. Truth or Lies? Just like me, I'm sure you hear news reports about various health issues on a daily basis. So which ones should you believe? Every month, Dr. Brownstein will discuss recent health items in the news, and share with you his insights on whether or not what you've heard is the real truth — or not. Case Studies. After treating tens of thousands of patients with integrative health programs combining the best of the medical and alternative health worlds, Dr. Brownstein has developed a massive collection of case studies that he's eager to share with you. You can use this real-world information to better your own health, and to prevent making some of the mistakes these patients made before they came to see him (many of them at their absolute wit's end). Nutritional Strategies. Sometimes it's the little things that make big changes in how great you can feel. That's why Dr. Brownstein feels you must know the truth about what you're feeding your body. Discover the little-known facts about such simple things as iodine and salt (the right kind of salt), grains and gluten, carbohydrates, and more. Learn how to shop for and prepare healthy meals, even make your family's favorite foods better for them. IMPORTANT NOTE: Sales tax included where applicable. Your trial subscription comes with convenient automatic renewal. At the end of your subscription, we'll notify you. If you want to keep the publication, do nothing and we'll renew your subscription using your credit/debit card on file. We'll charge you $54.95 (or $49.95 for digital) for one year (12 issues) of Dr. David Brownstein's Natural Way to Health and thereafter at the lowest rate then in effect. There is no risk, you can cancel within the first six months for a full refund of the unused portion of your subscription. Dr. Brownstein's Natural Way to Health is loaded cover-to-cover with the most recent insights on emerging natural therapies.